Stronger Faster Healthier Whey protein is a pure, natural, high quality protein from cow’s milk. 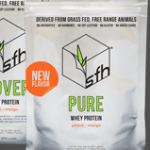 SFH whey protein is derived from grass fed, free range cows that are never treated with antibiotics or bovine growth hormones. It is a rich source of the essential amino acids needed on a daily basis by the body. This powder hydrates well in water and is absorbed very well by your body. All whey proteins differ in lactose content, fats and calcium and Pure Whey has low lactose content (averaging about 1.8%); is low in cholesterol; and high in free calcium. SFH Protein is an excellent protein choice for all ages including children and provides a number of benefits in areas including sports nutrition, weight management, immune support, bone health, and general wellness. If you are concerned about your child’s food choices, Pure Whey, with 89% protein content is an excellent choice to help kids grow up healthy. I’ve been using this product for 2 months now, and I will NEVER be without Stronger Faster Healthier Protein !!!!! It is as “clean” a protein powder as I have seen, from grassfed cows, with no gluten, soy lecithin, evil agents of death, etc. And here is the real kicker besides the absence of negatives: it makes me feel effing fantastic. One (or two) scoops of this about 30 minutes after a workout, and I have just ingested 25 (or 50) grams of muscle-building/repairing protein, and that “wiped out” feeling begins to leave. And then I can prepare a *real* meal full of fat, good carbs and more protein, eat it maybe 30 minutes after the powder, and be full, happy and awesome for hours. I don’t recommend using this as a meal substitute, but, rather, as an ace way of ingesting a heavy volume of protein as fast as possible post-workout. It isn’t replacing anything, just adding in more good stuff. 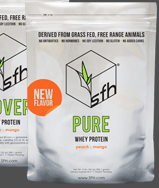 SFH Protein Powder Reviews by Becca B. My experience of this powder was that it was easy to mix and tasted good. SFH suggests you mix the scoop of powder with 6-8oz of water or milk (soy, dairy, nut, or otherwise). I tried the vanilla flavor and mixed it with water to avoid unneeded calories, and while it would have tasted better with milk, it tasted just fine mixed in water. SFH Recovery protein is also available in chocolate and natural flavors. Question: What is a protein similar to Stronger Faster healthier? Probably Progenex is similar. Question: Do you have any reviews for SFH vs Biotrust? Yes; we are working on a review now for both. Question: Where can I find out more info on CrossFit as my friend wants me to join their local gym?